"Good dog! Hold the enemy down while I shoot them! You get a biscuit!" The ranger is a jack-of-all-trades and a master of them all as well, relying on his keen eye, steady hand, or the power of nature itself. 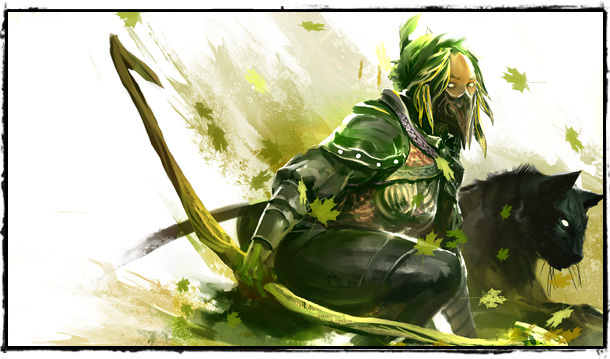 A master of ranged combat, the ranger is capable of striking unwitting foes from a distance with his bow. With a stable of pets at his command, a ranger can adapt to his opponents' strengths and weaknesses. A ranger is accompanied by his pet, a loyal animal companion. Rangers charm pets and then bond with them. A ranger can have up to three pets at his call, but generally speaking, only one pet can be active at any time. Pets' base health, armor, and damage are based on the level of the player that owns them. Pets are charmed by interacting with juvenile versions of the species you want to charm. 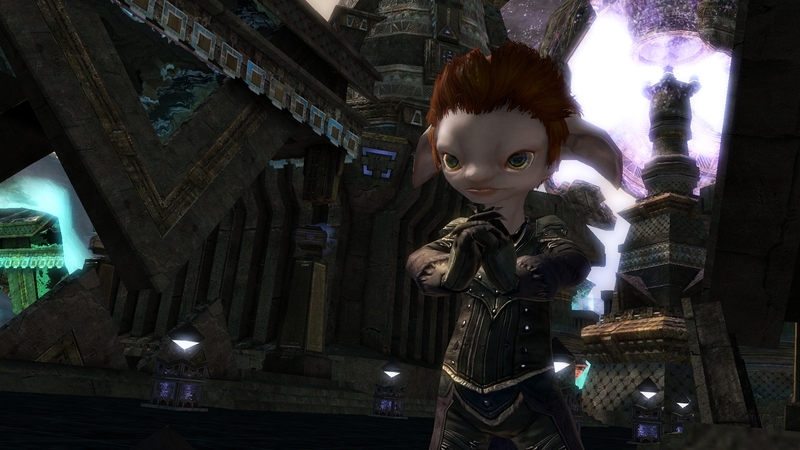 There are a variety of Tyrian species that can be charmed, including bears, moas, devourers, and sharks. As you adventure with a pet, it evolves to become more unique and eventually allows you to give it abilities that compliment your tactics. 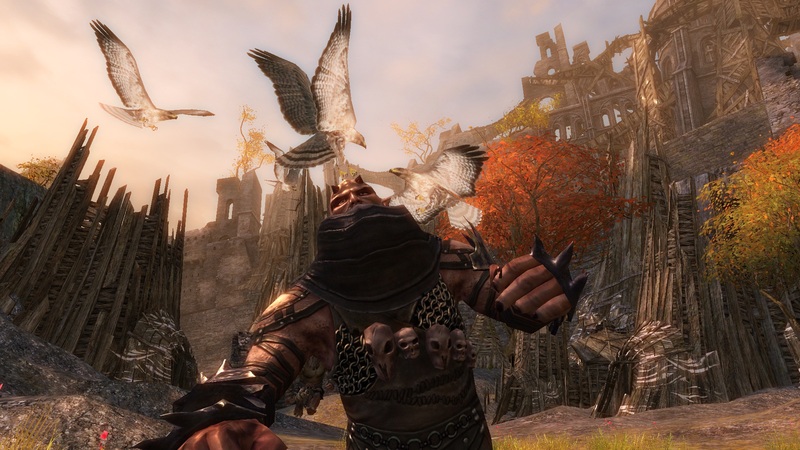 Rather than manage a unique resource in combat, a ranger will manage his pet, assigning them a behavior from aggressive to passive. A ranger can also manage his pet by giving commands such as "attack," "heel," and "stay." Traps--Traps are utility skills that can be placed at a ranger's current location. When an enemy enters a trap, it is triggered. For example, Spike Trap will cripple and bleed enemies that pass through it. A trap can remain active as long as the ranger chooses to remain close to it. A ranger can only have one of each trap type out at any given time. Spirits--A spirit skill summons a nature spirit that influences the area around it. For example, Sun Spirit applies additional fire damage to allied attacks inside its influence. A spirit stays out for a short period of time and goes away if the ranger wanders too far away from it. Spirits can be attacked by enemies and removed from the battle. A ranger can only have one of each type of spirit out at any given time. A ranger has three active pet slots. 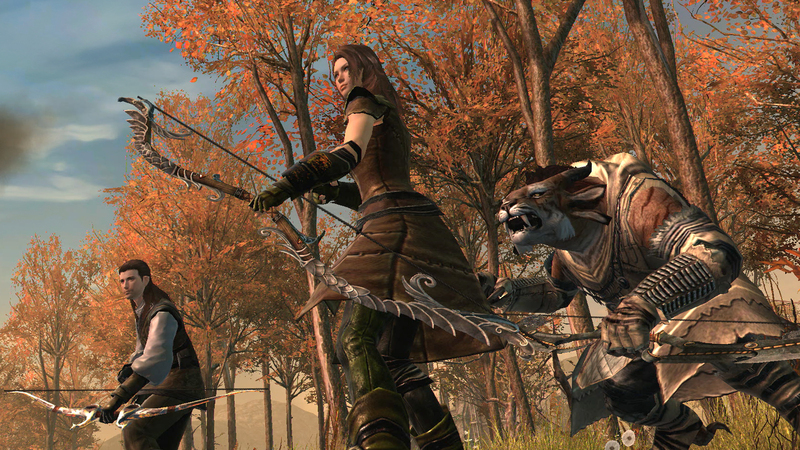 Outside of combat, or through the use of utility skills, the ranger can swap their active pet. There are 12 different types of pets, including some terrestrial (spiders), some amphibious (lizards), and some aquatic (sharks). Within each type there are subtypes that can influence pets' abilities. For example, a polar bear might have an Icy Roar, while a brown bear might have a Fearsome Roar. A ranger's pet gets its level from its master, which determines their basic attack, armor, and health. Pets have customization options. The first of these has to do with a pet's evolution level. Pets evolve up to 20 evolution levels. Each pet type receives automatic bonuses at different evolution levels. For bears, these bonuses might be increased health or increased damage. Pets gain evolution points when the player gains XP while the pet is active. At certain evolution levels, pets will unlock ability slots (up to 4 total). Ability slots can be filled from a list of active pet abilities based on pet type. Modes--Ongoing behavioral settings the ranger can toggle. Aggressive--Attack what I am attacking. Defensive--Attack enemies that attack me. Commands--Specific, direct commands that execute right away.